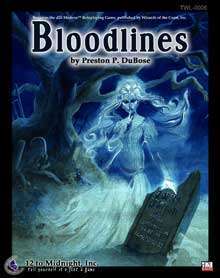 Bloodlines is a handy pdf for d20 Modern from the folks at 12 to Midnight. 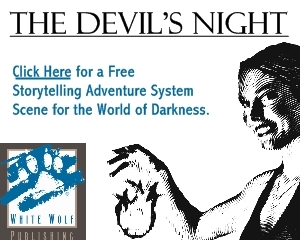 This adventure is written with 5th Level characters in mind, but is not a requirement. With a little prep, a GM can do just about anything with this material. Bloodlines uses the OGL Horror magic system from Mongoose Publishing, but has everything you need included. Coming in both “Printer-Friendly” and “Full versions as a set. The Full version is packed with handouts, bookmarks and is one of the best looking pdfs I’ve seen on the market. The Author’s Intro gives some great background info on how the product came about and some interesting thoughts on adventures in general. It is a great bit of personality that adds to the material. Bloodlines is both an adventure and a setting. The adventure tends to force the PCs along certain lines to get the story told, but then…most adventures do. The author covers this fairly well, offering tips and tricks to get things moving along that keeps the railroading to a minimum. Characters may have trouble getting into the adventure at first, but if the GM knows the players well, they can get through the rough spots and move things along. A bit of mystery, horror and plenty to keep the PCs busy helps out in this area. One of the great things about this pdf is the amount of useful “extra” information provided by the author. Alternate Plot Hooks, Player Handouts, useful sidebars about the setting or Pinebox NPCs. Bloodlines is full of them. The setting of Bloodlines, a small community called Pinebox Texas, is where Bloodlines really shines. This small town can be used in a number of ways beyond the Bloodlines adventure. It is full of dark secrets that can make any modern game (regardless of system) more interesting. Just reading through the pdf I had a couple of ideas for an ongoing campaign. The art in Bloodlines is great. It fits the material very well and adds more than enough flavor. The cover by Anneth Lagamo is spooky and makes a perfect start for the product. The interior art by Sergio Isaza Villa oofers plenty of dark imagery for the town of Pinebox. As mentioned above there are ton of “extras” in Bloodlines. Handouts galore, including in-character letters and hand-written notes, several maps of Pinebox and plenty of story driven clues for players to enjoy. Not only that, but 12toMidnight also extra free material on their website for this adventure. 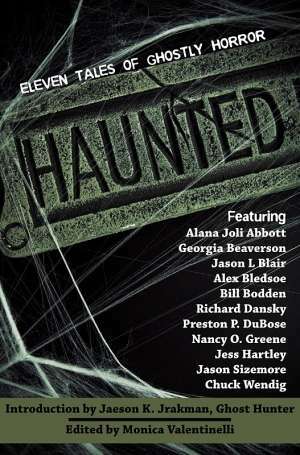 All-in-All, Bloodlines offers up a very interesting setting and a dark mystery adventure for the characters involved. I highly recommend getting copy to any GM looking for a little extra horror material.